Have you met Llama Llama yet? If not, get your four- or five-year-old to introduce you. 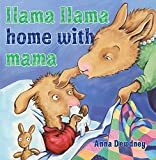 Llama Llama is the main character in a very popular series of children’s books by author-illustrator Anna Dewdney.